THE United Party for National Development (UPND) in its current form has no capacity to turn Zambia’s economic fortunes because it has been invaded by the infamous cartel that colonised the ruling party in its first three years in Government, Panji Kaunda has charged. Colonel Kaunda said the UPND had been hijacked by the cartel that only a few years ago branded the opposition party a Bantustan party whose aim he said, was to suppress all freedoms and rights of citizens. Col. Kaunda said the people of Eastern Province had decided to support President Edgar Lungu and that a group called ‘‘Kum’mawa for Edgar Lungu’’ had been formed to sensitise the region to turn up in large numbers in the general elections next month to improve the rural vote and defend the presidency. Col. Kaunda, who is ‘‘Kum’mawa for Edgar Lungu’’ leader, said the people of Southern Province had shown that they would continue to increase the number of votes for Hakainde Hichilema, the UPND presidential running mate, and it was important for Eastern Province to emulate their counterparts in the Southern region. 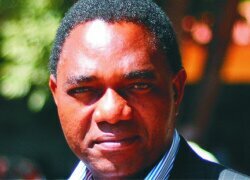 of State as those from Southern Province would be voting for Mr Hichilema. He said in the one and half years President Lungu had been in State House, he had managed to unite the country through political power balancing in his Cabinet. Col. Kaunda said President Lungu had managed to preside over the country’s affairs under difficult political and economic times but had remained judicious in all his decisions. “The UPND is now being championed by the infamous cartel that was in the PF and suppressed the freedoms and rights of many citizens. In its current form, the UPND has no capacity to turn the economic fortunes of the country because it has embraced the cartel. As the people of Eastern Province, we must defend the presidency by turning out in large numbers to vote for President Lungu next month just like the people of Southern Province would be voting for Mr Hichilema in large numbers even when they know he is not going to win the elections,” Col. Kaunda said. He stated that Eastern Province had not been impressive in previous elections because of apathy and the formation of ‘Kum’mawa for Edgar Lungu’ was meant to sensitise the people in the region to take the coming elections with all seriousness.